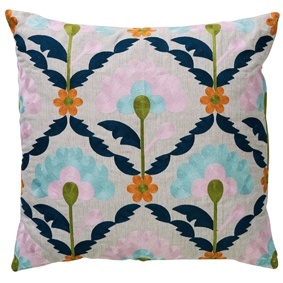 The Bloomsbury Market Cushion features a large-scale floral repeat that has been embroidered across the surface. The cushion has a natural cotton reverse. The Bloomsbury collection is highly patterned with a mix of geometric prints and floral motifs. Each cushion has been machine embroidered and some feature extra details such as mirrored circles. An unexpected palette of Pale Lilac, Ice Blue, Olive and Orange bring this collection to life, making it fun and colourful.